There is a fascinating property dispute brewing in Virginia. Dr. Marc Gallini and Frank Ciampi almost became galactic fodder when a meteorite came crashing into Examining Room No. 2 at their Williamsburg Square Family Practice. They decided to give the meteorite to the Smithsonian for a $5000 payment of “appreciation.” Now, the landlord Deniz Mutlu and his family have reportedly notified the Smithsonian that the meteorite is theirs, His brother and fellow landlord, Erol Mutlu, wrote to the museum that they would come to retrieve it by the end of the day. There is a meteorite market and this object could easily bring tens of thousands of dollars. The Smithsonian wants to study the 4.5. billion-year-old stone and display it at the National Museum of Natural History. The Mutlu family wants the rock which could easily bring $50,000 but the doctors are seeking a lawyer to contest that claim. It is an interesting question of whether a rock from space belongs to the leaseholders or the landlord. After all, it came through the exterior of the building belonging to the landlord. On the other hand, it came to rest in an area leased by the doctors. Disputes often arise over “found property” where a finder claims ownership over an object that the land owner was unaware of before the discovery. Recently an English court ruled that a town owned a medieval brooch found by a treasure hunter on public land, here. One of the most famous cases was Hannah v. Peel, 1 K.B. 509 (1945), where a soldier staying at a manor during wartime found a brooch while hanging blackout curtains. The court ruled that the brooch belonged to the soldier because the owner only could claim all property attached to or under the land. The brooch was lying in a crevice on top of a window frame. The courts previously ruled in South Staffordshire Water Co. v. Sharman that rings found in the mud at the bottom of a pool belonged to the owner and not the finder because they were part of the real estate. Of course, in this case, the doctor have a leasehold claim. The property in dispute passed through the landlord’s apartment structure and came to rest in leasehold area. It was embedded in the property, but the landlord gave the doctor’s rights to that property for the length of the lease. The landlord could not claim cash abandoned in the office by a patient. The question is whether property that passed through the superstructure is subject to such a claim. One interesting twist is the doctors liability for damage to the building if the meteor is their property. Does this mean that they can keep the $5000 but must pay for the damage caused by their property? The museum can clearly hold on to the rock while this ownership question is being resolved. 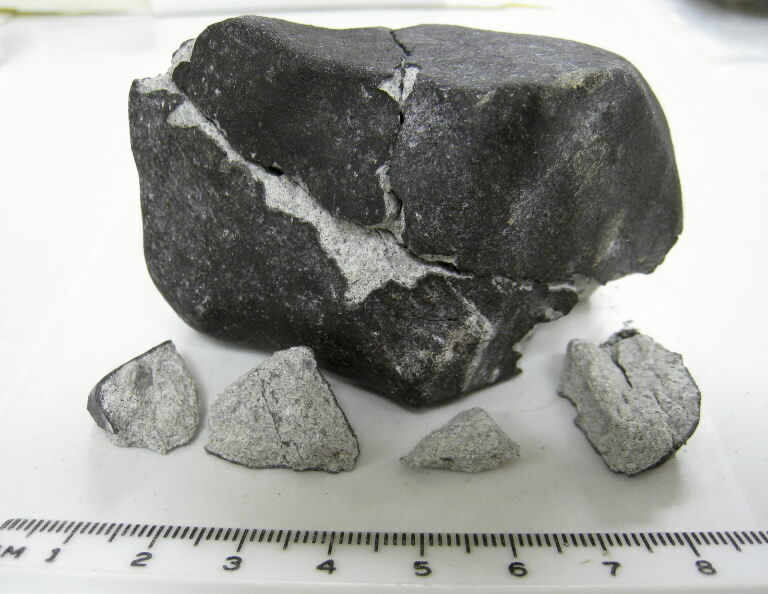 The entire Lorton meteorite weighs about a half-pound, but it is broken into three main pieces with four or five dime sized bits. This particular property dispute took billions of years in the making. It likely started around 4.5 billion years ago at the formation of the universe and is likely composed of chondrite from the molten droplets that were floating around at the time. Eventually, these rocks came to be part of an asteroid belt between Mars and Jupiter. After being bumped out of the belt, it probably took thousands of years to hit the doctors’ office in Lorton, Virginia. It’s seems that a good portion “disappeared”. I think that ticked-off the magistrate. Even though I think the ruling should have been in favor of the current homeowner, the magistrate judge left him out of the judgment. It seems judges just don’t like the “it just diappeared” excuse. In addition, it looks like the current homeowner fessed up to spending a good chink of it. Here’s more. Seems the original owner’s heirs did get part of the loot. The homeowner and finder didn’t get to keep it all. Here is a link to the case. Maybe my memory fails me. I don’t recall who ended up with the loot for sure. If I remember correctly the heirs of the man who left the money behind were deemed to be the rightful owners. Interestingly enough some of the money was in quite rare currency dating back to pre depression. If the homeowner and the repairman would have kept their mouths shut they could have quietly kept the money. The heirs (rightful owners) found out about the find due to the legal hassle. As to the rest of your post, I think the homeowner would be considered the owner of the money. But I think giving it back to a previous homeowner who forgot it was there is a very honorable thing to do. There was one in Cleveland some time ago where they found money hidden in a wall. A lot of money. The owner and repairman who found it go into a legal hassle over the split and the find became well known. It turned out they were able to find the rightful owners of the money and neither one of them got any of it. Since the meteorite was not their property as it smashed through the building, but only once it came to rest in the leasehold property, I submit they are NOT responsible for damages. You know darn well the Earth and the Universe were simultaneously created 6000 years ago ’cause Jerry Falwell’s ghost and the crowd at Liberty Univ. tell me so. That rock started heading for earth a few thousands years or so before it was created. Okay, your arguments about controlled demolition. A meteorite hit the earth? What melted? For the sake of Slartis everywhere, somebody tell me something melted. I think I’m safe in assumin’ that you was a boy before you became a man…and just a twinkle in yer daddy’s eye before you was a baby. Well…that hunk of chondrite that fell in Lorton was a fiery meteor before it became a meteorite…and a meteoroid before it began to blaze a trail in Earth’s atmosphere). Doncha go accusin’ me of ahighjackin’ this thread. I got my feet on solid galactic ground here. Cosmologically speaking…I know meteorights from meteowrongs. Prof. Turley, don’t forget goddard v. winchell, 52 N.W. 1124 (1892), and The Hodges Aerolite (sorry, you’ll have to google). you do know that this statement erases the rule of law and individual rights don’t you? Who is the property stolen from? Proudhon was a European and so had been influenced by the divine right of kings. And I would agree with that because most of that property was taken by force from people who worked the land and had some claim to it by virtue of “homesteading” rights. But to state that property lawfully obtained is theft is to negate the law and the rights of individuals. So basically that statement is condoning theft and placing the collective above the individual. If no one owns it then it is owned by all. Property that belongs to no one can be claimed by virtue of increasing the value of the land through working it for a set amount of time and then registering it with the proper authorities. Our entire civilization is based on individual rights and by extension property rights.